The Firestorm Viewer is the most popular on the hypergrid by a wide margin, according to today’s analysis of Hyperica server logs. More than half of the last 3,600 visitors to Hyperica used the Firestorm Viewer. Less than a third used Singularity, and CtrlAltStudio, Cool LV, and Replex were all around 3 percent each. Kokua accounted for just over 2 percent of visitors, followed by Imprudence and OnLook at around 1 percent each. These numbers are for Hyperica visitors only — many closed commercial grids use their own viewers, and those numbers wouldn’t show up in these statistics. The Firestorm viewer is currently the most popular viewer in Second Life, and it makes sense for people to continue using a viewer they like and are familiar with when they come to OpenSim. Plus, the Firestorm viewer developers have openly committed themselves to supporting OpenSim for the long term, and, last night on Metaverse Week in Review, project manager Jessica Lyon repeated that pledge. 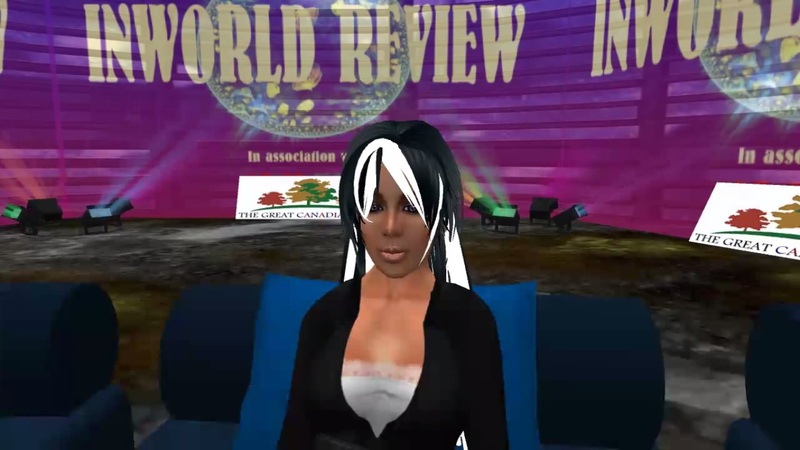 “I believe that the future of virtual worlds lies in OpenSim,” she said, at the 1:05 mark in the video below. Firestorm publishes two versions of its viewer — one specifically for Second Life, with the proprietary Havoc physic engine for pathfinding and physics mesh uploads, and the other for OpenSim. But she doesn’t advise people — including Second Life users — to use the Second Life viewer. “I recommend everyone use the OpenSim viewer,” she said. She explained that only a handful of people would ever need the specialized physics mesh upload option or the pathfinding creation tools that the Second Life-specific option offers. “The OpenSim version can upload mesh as well, just not with the physics attribute,” she added. In fact, she said, the majority of Second Life users do actually use the OpenSim version and, thus, have access to all the OpenSim grids with the same viewer. There are also other benefits to using a popular viewer. For example, it’s easier to get help with a viewer that everyone else is using. There are also more people working on bug fixes and other improvements. New features that are developed in other viewers get thoroughly tested by the users of those other viewers and prove their value before they’re added. Finally, there are usually good reasons why a particular viewer is more popular than another. 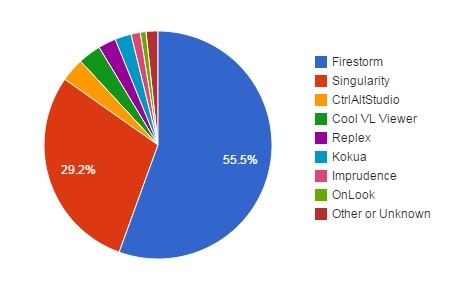 While other viewers may have certain features that appeal to particular groups, Firestorm seems to be the viewer that serves the majority of people best. I was inspired to run the numbers because I’m working on a Destination Guide based on the Hyperica directory, and different viewers have different methods for coding destination links. Testing the directory against every single viewer was becoming really time-consuming, since each time I made a change, I had to check it with several different viewers! In particular, Kokua and Imprudence use an old-style coding scheme that isn’t supported by the new viewers. These viewers are popular with people who need an old-fashioned interface — but, according to my visitor logs, not that popular with the average hypergrid traveler. So right there, two fewer viewers I need to test with. Ideally, of course, all the viewers would get on the same page and adopt a common protocol. Last night, I had a chance to ask Firestorm’s Lyon about the coding issue. It’s a long show, but some of the discussion starts at the 21 minute mark. 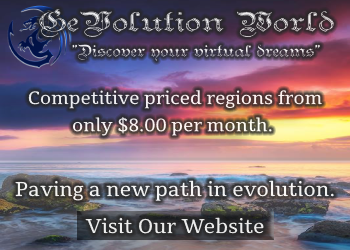 “This is the first I’ve heard of OpenSim grids taking advantage of the Destination Guide,” said Lyon. Some grids — Openvue and OpenSimulator Community Conference grids in particular — have had Destination Guides in place since last summer. But the news hasn’t necessarily spread far. Lyon wasn’t the only one — I only heard about this feature recently, when Xmir’s Gavin Hird posted about it on Google Plus this past week. She mentioned that one thing she’d like to see is a protocol that allows people to click on a link in a regular Web browser, and it automatically opens a viewer and, if the grid isn’t in the grid directory, automatically adds it in. But Lyon said that OpenSim users could help Firestorm’s efforts in several ways. First, she urged those with Second Life accounts to join the Firestorm Early Adopters and Testers group. Second Life account holders can also attend Firestorm Classes, which usually end with a question-and-answer session. 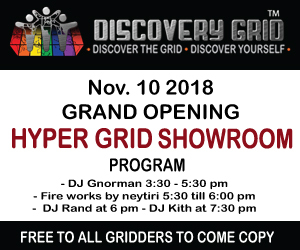 The Littlefield Grid is currently working on organizing Firestorm-related events for those on the hypergrid, and runs the Firestorm on OpenSimulator Google Plus community. Lyon also recommended that people post bug reports on the Firestorm Jira (free account required), or even email her directly. She said she welcomes input from OpenSim users.